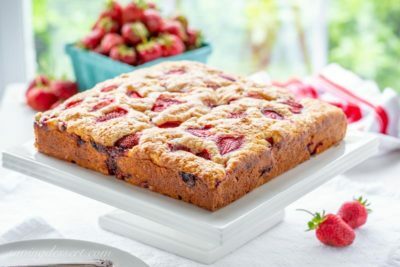 Strawberry Breakfast Cake made with fresh juicy strawberries tucked into a moist sour cream batter. Not overly sweet, this cake is terrific served for breakfast, brunch or as a light dessert. 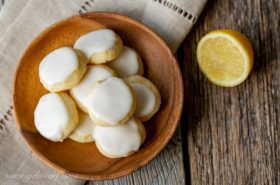 Breakfast cakes are seriously growing in popularity, and for good reason. It’s a great way to showcase seasonally fresh fruits in a simple and delicious all-purpose cake. We’ve shared many breakfast cakes over the past few years, and all have been a big hit with our family and yours. Our Raspberry Ricotta Breakfast Cake is made with frozen berries, making it a good choice all year round. The ricotta gives it a wonderful texture and moist crumb and the tart raspberries really pop. One of the most popular recipes on SRFD is our Blueberry Breakfast Cake. 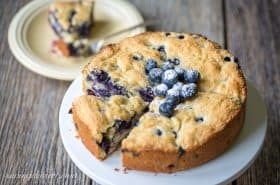 It’s a luscious cake bursting with juicy ripe blueberries and a hint of lemon. Another popular favorite is our Lemon Crumble Breakfast Cake with plenty of lemon flavor and a sweet crumble top. For the holidays we love to share this Cranberry Almond Breakfast Cake made with almond paste and almond extract, so delightful! 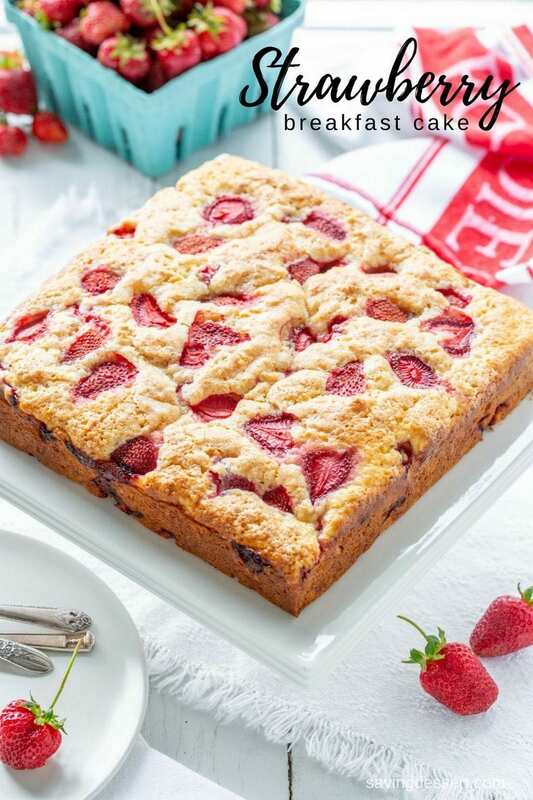 This strawberry breakfast cake is made easily by hand, no mixer required. The cake batter is nice and thick to hold up all the juicy fruit but it’s not dense or dry once baked. 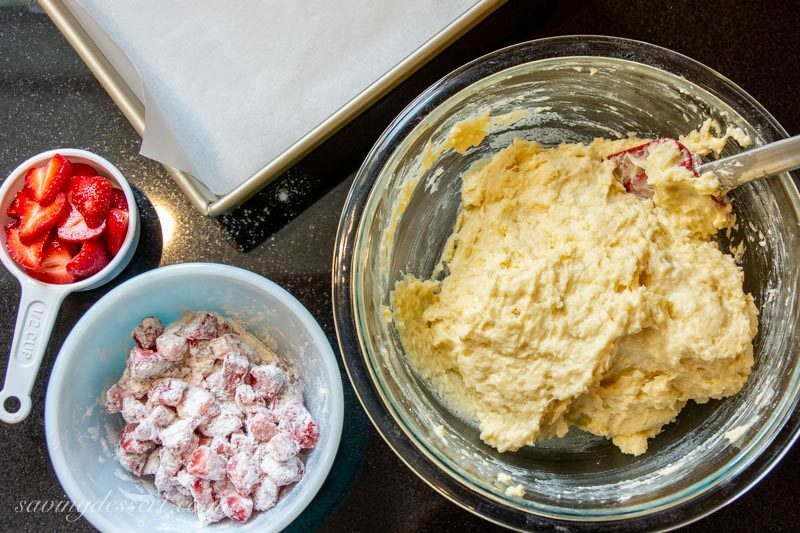 Toss the chopped strawberries in a portion of the flour to help them stay in place in the batter. Finally, we like to top the cake with a few sliced berries for a pretty pop of color. As with most fruit-centric recipes, the better the fruit, the better the end result. 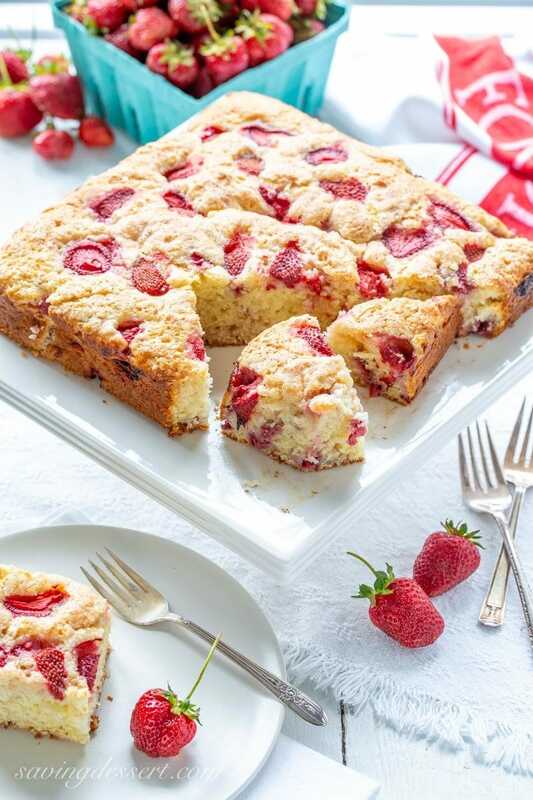 Use firm, ripe strawberries in this breakfast cake for best results. I picked these from our favorite local farm on a nice rainy day. I’m going to miss strawberry season! Feel free to bake this cake in a round cake pan, square or spring-form pan. Watch the baking time if using a dark colored or glass baker. If you want to dress it up a bit, add a dollop of sweet whipped cream and sliced berries on top. That would be a nice play on strawberry shortcake, yum! Bake with a little sprinkle of coarse sugar on top for a nice sweet crust. Refrigerate leftovers if you have any and enjoy! Made with fresh juicy strawberries tucked into a moist sour cream batter. 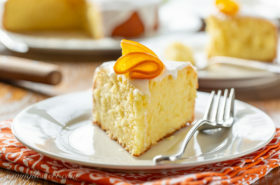 Not overly sweet, this cake is terrific served for breakfast, brunch or as a light dessert. Preheat oven to 350F. Lightly coat a 9x9-inch pan with vegetable cooking spray, then line with a piece of parchment paper, leaving an overhang on two sides. In a large mixing bowl whisk together 2 cups of the flour, salt, baking powder, baking soda and 3/4 cup of granulated sugar. Make a well in the center and set aside. In a small bowl combine 1 cup of the chopped, quartered strawberries with the remaining 1/4 cup of flour. Toss to coat. 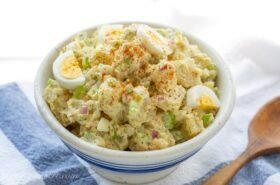 In a separate small mixing bowl, combine the sour cream, melted cooled butter, vanilla and the lightly beaten eggs. Fold together with a rubber spatula until blended. Add the sour cream mixture to the flour and sugar. Fold together until the dry ingredients are moistened. Gently fold in the 1-cup of chopped strawberries. Spoon the batter into the prepared pan and spread evenly. Allow the cake batter to rest at room temperature for 15 minutes before baking. Scatter the remaining 1/2 cup of sliced strawberries on top of the cake batter, then sprinkle with coarse or granulated sugar. Bake at 350F for 35-45 minutes or until a toothpick inserted in the center comes out with no wet batter. The top should be light golden brown. Cool slightly before serving either warm or at room temperature. Store leftovers in the refrigerator. This recipe has not been tested with frozen strawberries. 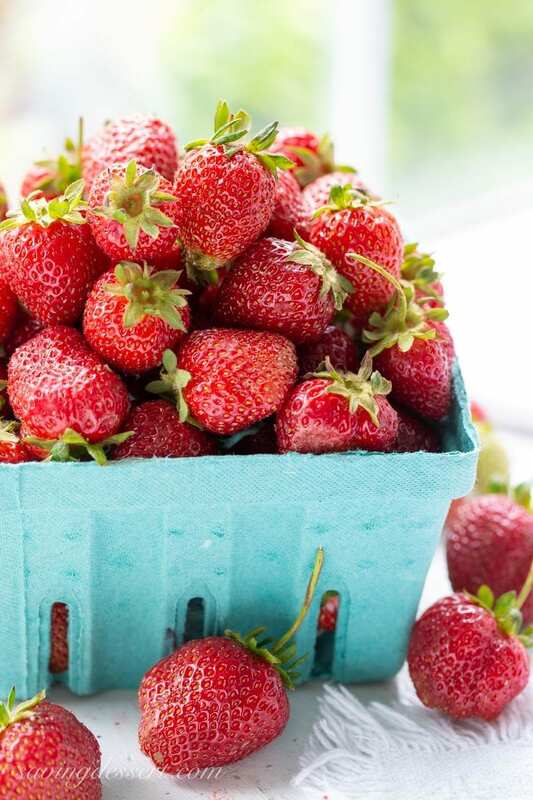 Strawberries are one of our favorite fruits. 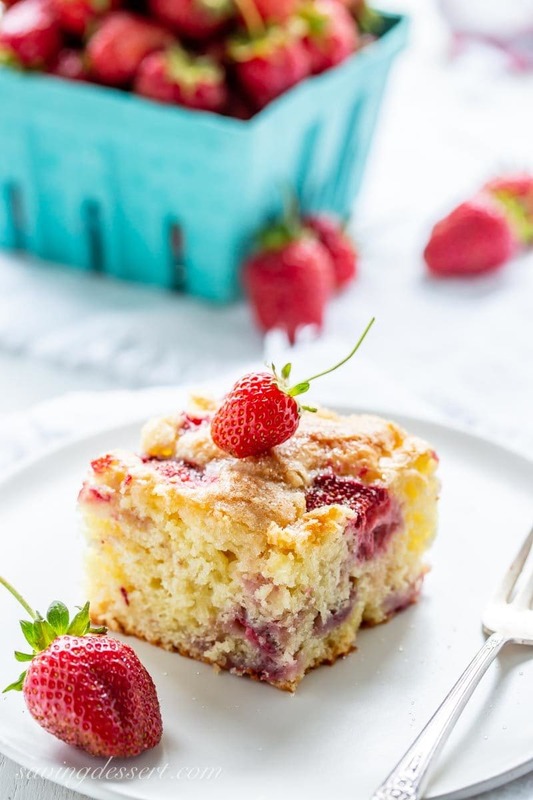 We love them plain, baked into cakes, layered in our Mixed Berry Trifle, scooped into a fantastic Strawberry Dutch Baby Pancake, or on our Strawberry Mascarpone Cake. Homemade Strawberry Jam is one of the greatest things on earth – yum! Did you know that it’s super easy to dry Strawberries? Check out this post for How to Dry Strawberries from The View from Great Island. Mary from Barefeet in the Kitchen knocked it out of the park with this wonderful Strawberry Rhubarb Crunch recipe. We love baked fruit desserts too! Have you ever tried strawberries on a pizza? Kristen from A Mind Full Mom shared a gorgeous recipe for Strawberry and Arugula Pizza that’s both sweet and savory. Finally, here’s another must-try cooking method for Roasted Strawberry Sauce from She Wears Many Hats – perfect on everything from waffles to cake, or a bowl of yogurt. I eat this cake any time of the day, it looks super delicious. Oh, my gosh, this puts today’s breakfast to shame! What an amazing coffee cake—perfect for summer!! I want some…now! The crumb looks so moist and inviting, Tricia. What a wonderful way to use those gorgeous, fresh strawberries! Honestly Susan I could eat a big slice right now too – so delicious! I am so glad you went strawberry picking! This way we get to see all your wonderful recipes! I think this could very well be Sunday’s breakfast! Aww thanks Abbe – it has been fun! I wish I could deliver some to you Sue – we could be taste-testers for each others recipes. Hope you get the chance to make this sometime! Love strawberry cakes..cannot have too many recipes.Beautiful! Can I please have a piece of this great looking cake, it looks delicious.Pinned! 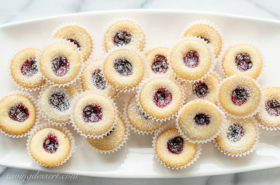 I loved your blueberry breakfast cake and love this rendition! How pretty and how perfect for a summer breakfast/brunch! Cake for breakfast? wow…why not?! Those strawberries look so fresh and juicy!